The Great (Whim)Bot Off is all about drawing robots. WhimBots are the friendly and often cheeky robots who live in the little world of WhimSicAL LusH. They get up to all manner of games and nonsense and love a good story. 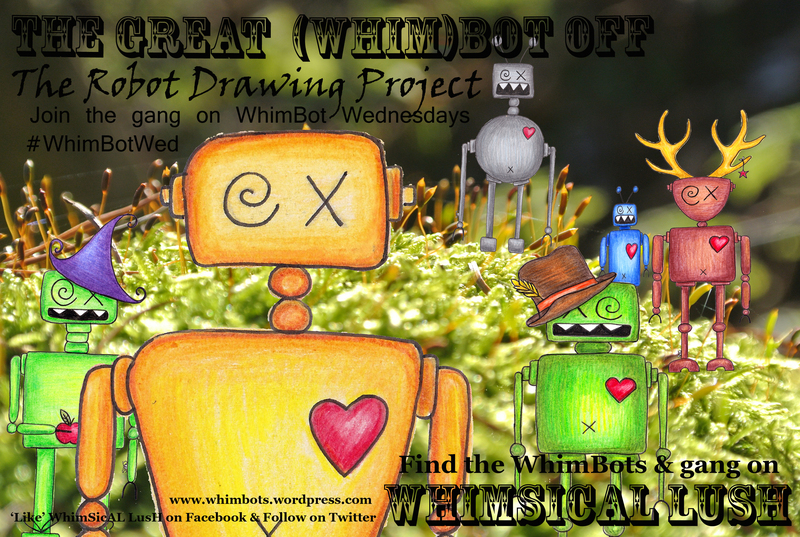 The WhimBots and I would like to invite you to join our gang of robots and WhimBots and join in the fun! All you need to do is draw a ‘bot! Posting it or sending it by private message to the WhimSicAL LusH Facebook page..
Email it to Suzanne on suzannemscott@googlemail.com..
Make use of the ‘Bot Drop’ at Diaosu Limited in Dundee, where you can drop off your drawings. Please include a little story (even just a few words) about your ‘bot plus your name, where you live, and an email address (I will only publish information that you agree to). Wednesdays will now become WhimBot Wednesday as that will be the day that Suzanne and the WhimBots shall be introducing new ‘bots to you and each other on their own Blog, the WhimSicAL LusH Facebook page and over on Twitter! Check out #WhimBotWed. Last year the ‘bots had a big exhibition of over 70 ‘bots and WhimBots (from all over the world). It was both online and in the Diaosu Gallery in Dundee and it was fantastic. It would be a crime to not keep it going… so they are once more calling out for more ‘bots to join them so that the fun can continue. What will be next for the gang? Another exhibition? A book? Watch this space! Watch out also for markets and events that Suzanne shall be at too with the WhimBots and her other WhimSicAL LusH inhabitants, where there will be paper and pens/ pencils available for on the spot scribbles (just ask her!). P.s. If you would like to create a robot using methods other than drawing please do feel free and send in photos of your ‘bots as above. Last year there were several sculptures and a film too!